In the below video, FSU Art alum Emily James updates us on a commissioned painting she recently completed, works-in-progress and more. You can watch Emily paint at her gallery on 5th Avenue in Naples most afternoons in season. Emily is the only artist in the United States selected by the top three fine art publishers, and two of her images have been among the top 50 selling prints worldwide. She has exhibited at the High Museum in Atlanta, and was selected as an Outstanding American Woman in the Arts. Emily is a signature member of the Florida Watercolor Society, accepted into Watercolor U.S.A., and featured in the book, The Best of Watercolor. With her acrylics and oils on canvas, Emily has received numerous Best-in-Show ribbons, and has had many one-woman shows, one of which sold out before it officially opened. Known for her versatility in both subject and style, she enjoys painting landscapes, seascapes, abstracts, and contemporary works, and she is a portrait artist as well. 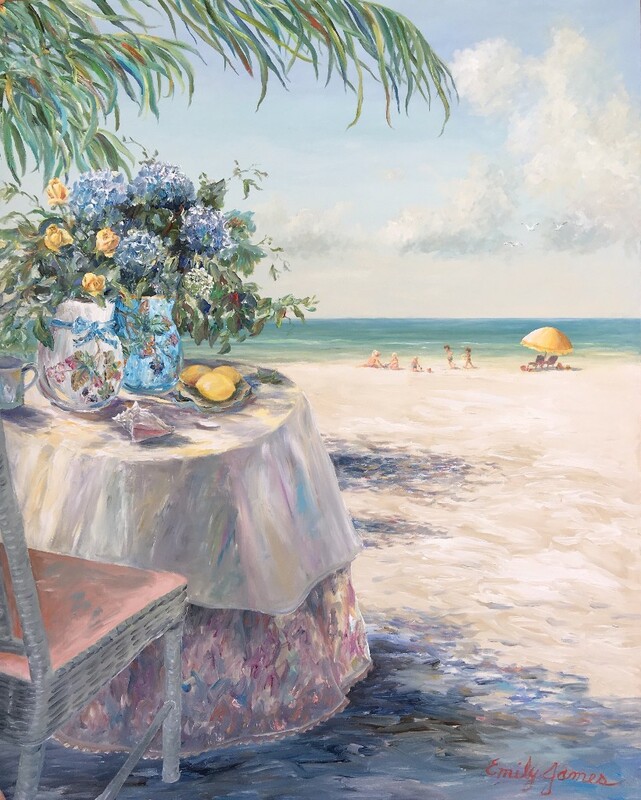 In her Florida paintings, she creates tropical scenes as well as sea and beach paintings. Emily specializes in creating custom artwork with the feeling, colors, and subject the owner will enjoy viewing. From her earliest childhood memory of looking for more paper on which to draw, she continues to paint daily in her studio overlooking 5th Avenue of Naples, Florida.